Our Wool + Linen Patchwork Quilt pairs Purl Soho’s pure and sturdy Warsa Linen with Lanecardate’s soft and elegant Lana Cotta Canberra wool. 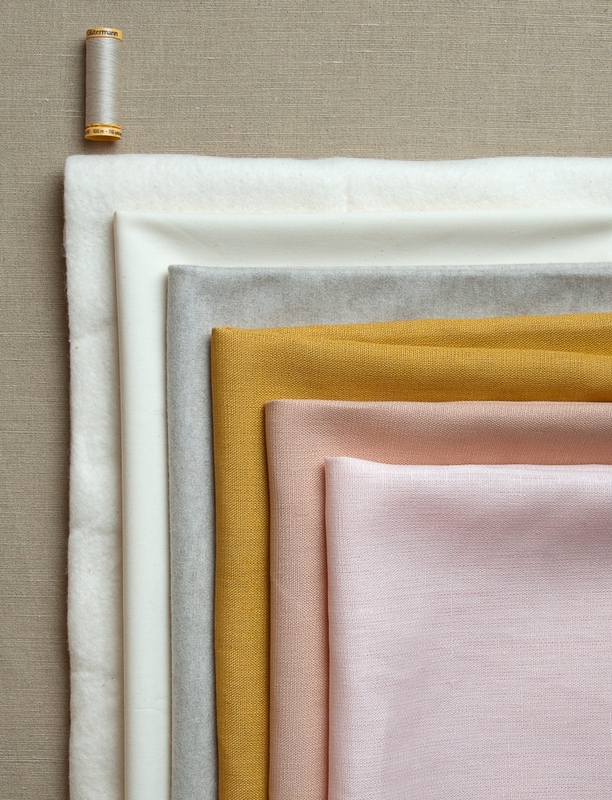 These two may seem like unlikely bedfellows, but the luminous clarity of the linen together with the rich depth of the wool create a bold mosaic, unexpected and totally beautiful! All seam allowances are ¼ inch unless otherwise noted. The wool fabric (Fabric 1) is the only fabric in this project that has a right and wrong side, but it can be a bit hard to tell which is which. If you look closely, the right side is covered in very small “V” shapes (for you knitters out there, this is the knit side of stockinette stitch). 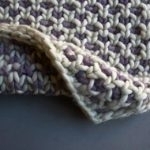 The wrong side is covered in “U” shapes (this the purl side of stockinette stitch). Note: You will cut three shapes for this quilt: Pieces A, B, and C. Because the wool has a right and wrong side and the linens do not, the cutting instructions for the two fabrics are slightly different. 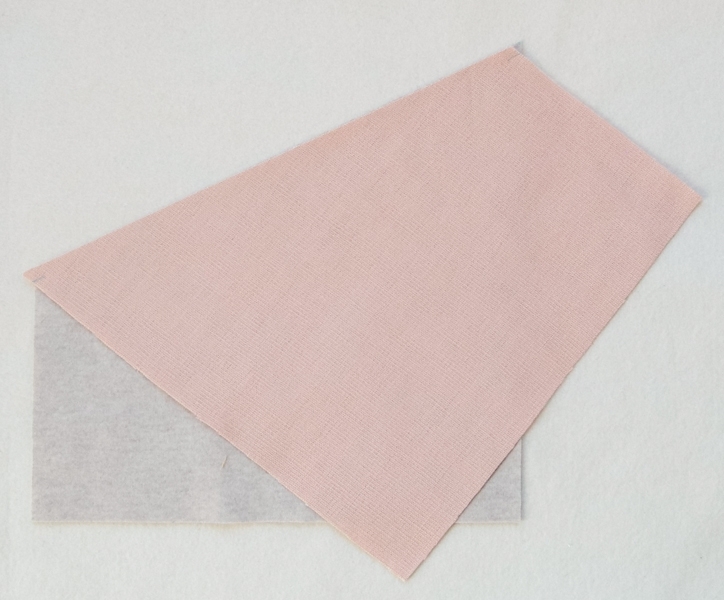 Cut a strip of wool 10 ½ inches wide from selvage to selvage and cut off the selvages. This strip will be about 59 inches long. With the right side of the fabric facing up and the short edges at the top and bottom, make a mark 5 3/8 inches above the bottom right corner of the strip. Make another mark 10 5/8 inches above the bottom left corner of the strip. Lay the rotary cutting ruler diagonally across the strip, from mark to mark, and then cut along this diagonal line. The remaining bottom piece is your first Piece A. When oriented so the right angles are on the bottom, it is a trapezoid with a long left side, a short right side, and the top edge angling downwards from left to right. Now returning to the strip, make a mark 5 3/8 inches above the bottom left corner and 10 5/8 inches above the bottom right corner. Lay the rotary cutting ruler perpendicular across the strip, from mark to mark. Make sure both sides of the ruler make a 90º angle with the left and right sides of the strip (If you aren’t getting a 90º angle, re-measure the marks). Cut along the ruler. The remaining bottom piece is another Piece A. Rotate it 180º and you’ll see that it’s exactly the same as the first one you cut. You will continue to cut A pieces along this strip, getting 8 pieces per strip. Cut a strip of wool 10 ½ inches long, from selvage to selvage, and cut off the selvages. This strip will be about 59 inches long. With the right side of the fabric facing up and the short sides at the top and bottom, make a mark 10 5/8 inches above the bottom right corner of the strip. Make another mark 5 3/8 inches above the bottom left corner of the strip. 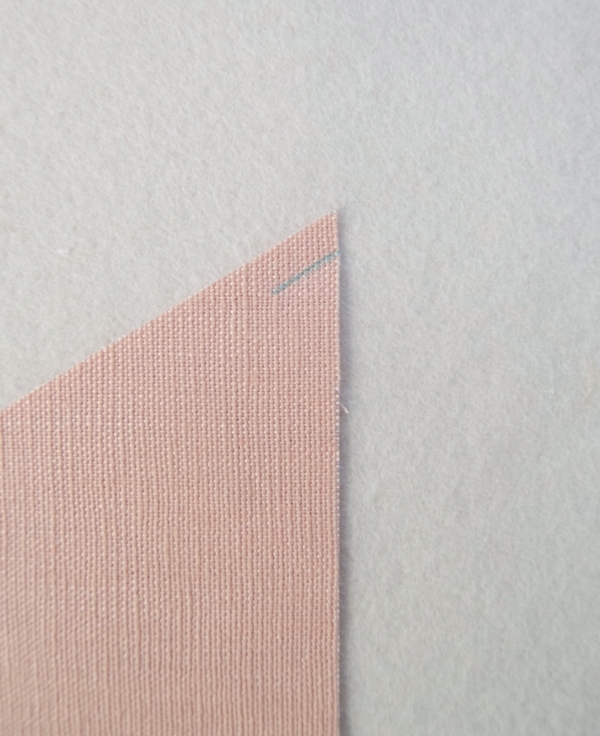 Lay your rotary cutting ruler diagonally across the strip, from mark to mark, and then cut along this diagonal line. The remaining bottom piece is your first Piece B. When oriented so the right angles are on the bottom, it is a trapezoid with a long right side, a short left side, and the top edge angling upwards from left to right. Now returning to the strip, make a mark 10 5/8 inches above the bottom left corner of the strip and 5 3/8 inches above the bottom right corner. Lay the rotary cutting ruler perpendicular across the strip, from mark to mark. Make sure both sides of the ruler make a 90º angle with the left and right sides of the strip. Cut along the ruler. The remaining bottom piece is another Piece B.
Rotate it 180º and you’ll see that it’s exactly the same as the first one you cut. You will continue to cut B pieces along this strip, getting 8 pieces per strip. 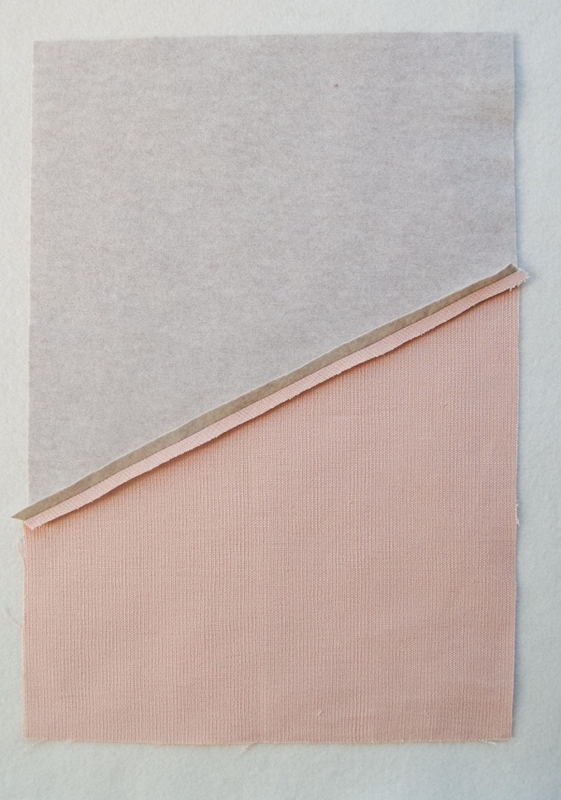 Since the linen fabrics don’t have a right or wrong side, Pieces A and B are interchangeable. An A can become a B simply by flipping it over, so feel free to cut these pieces all in one orientation and then flip them as needed. Piece C is a rectangle, 10 ½ inches wide x 5 ½ inches long. 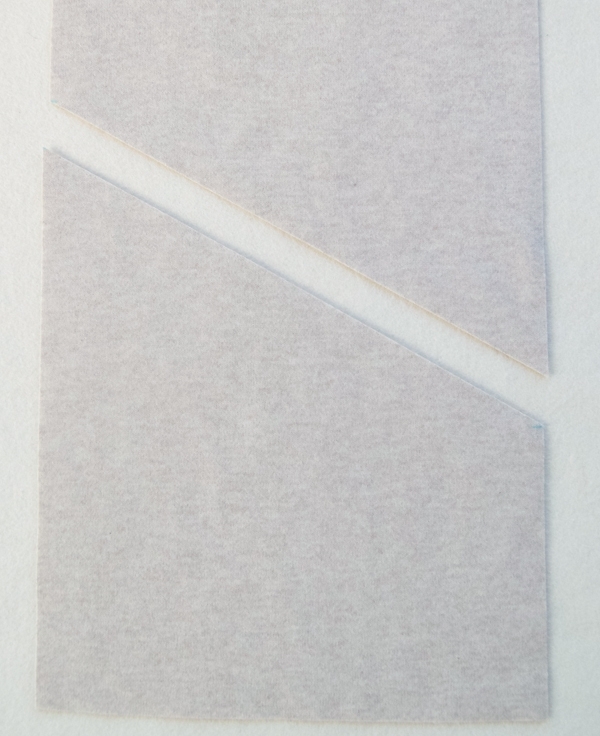 Note: When you cut the linen fabrics, be sure to make note of the right side and wrong side of each Piece when it is in its correct orientation. Binding Strips: Cut 4 strips 2 ¼ inches wide by 59 inches long. You can set these aside for now. Cut a rectangle 58 inches wide by 63 inches long. You can set this aside for now. Gather all the linen A and B pieces. Flip each piece so its wrong side is facing up and lay a rotary cutting ruler ¼ inch from the diagonal edge. 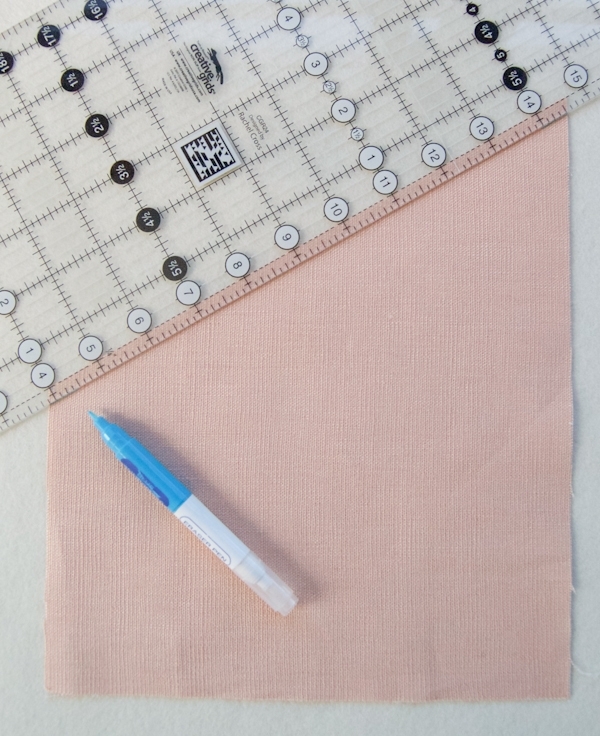 Make an approximately ½ inch long mark along the ruler at each edge of the fabric. 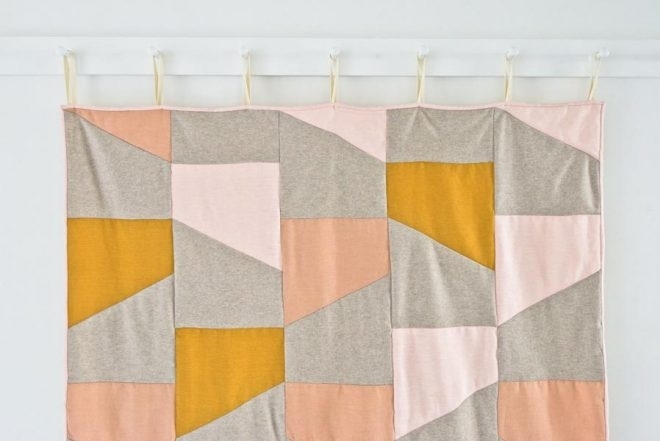 Do this to all the linen A and B pieces. 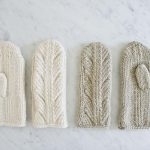 You will pin and piece all of the linen A pieces to the wool A pieces and all the linen B pieces to the wool B pieces. Lay down a Piece A of Fabric 1 (A1) with its right side facing up and the right angles at the bottom. The long side will be on the left. 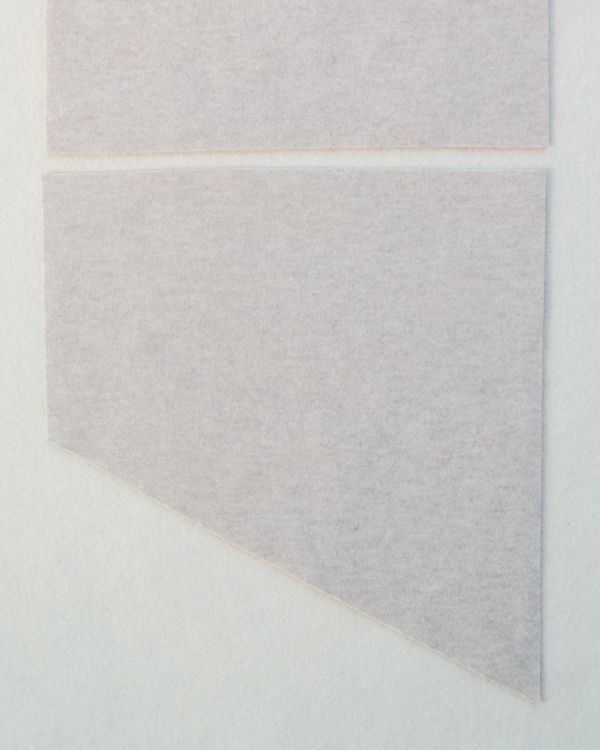 Lay a linen Piece A (in this case, since it’s Fabric 2, “A2”) on top of A1, wrong side facing up and its diagonal edge flush with A1’s diagonal edge. The linen’s short side is on the left. 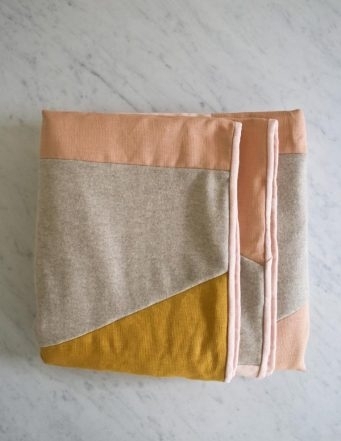 Arrange the linen piece so its left mark meets the side edge of A1. The right-hand mark should also just touch the edge of A1. Pin the pieces together along this edge. 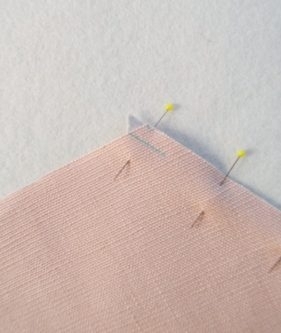 Sew the pieces together along the pinned edge and then press the seams open. This is now an A2/A1 Block. The linen section of the block is always the top, and the wool section is always the bottom. 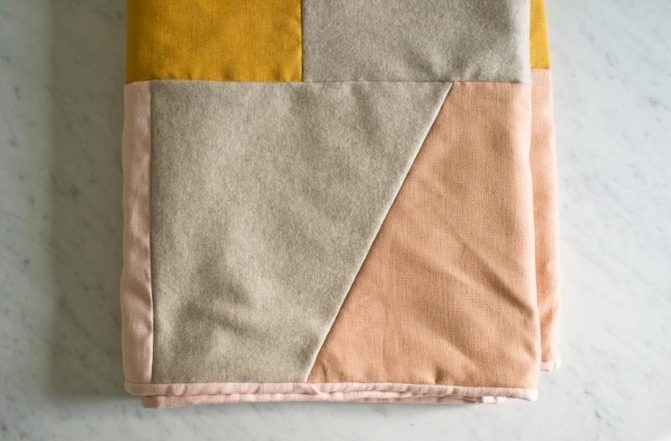 Repeat this for all of the A and B pieces, always attaching a wool piece to a linen piece. 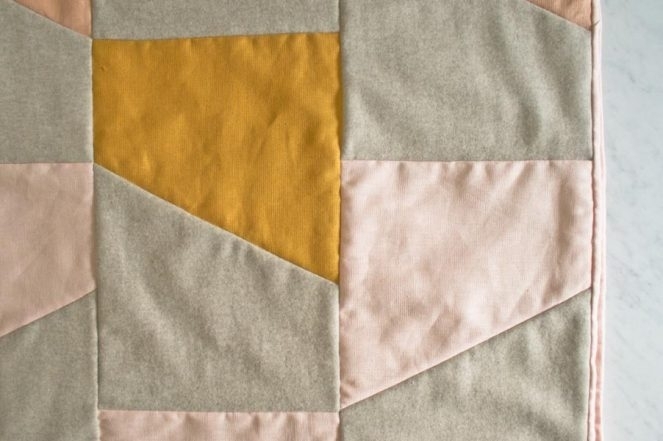 For both Pieces A and B, be sure to pin the acute angle of the wool piece to the obtuse angle of the linen piece. Gather all of the blocks and C pieces and put them into piles, one for each row, arranged in a stack from bottom of the quilt to top. 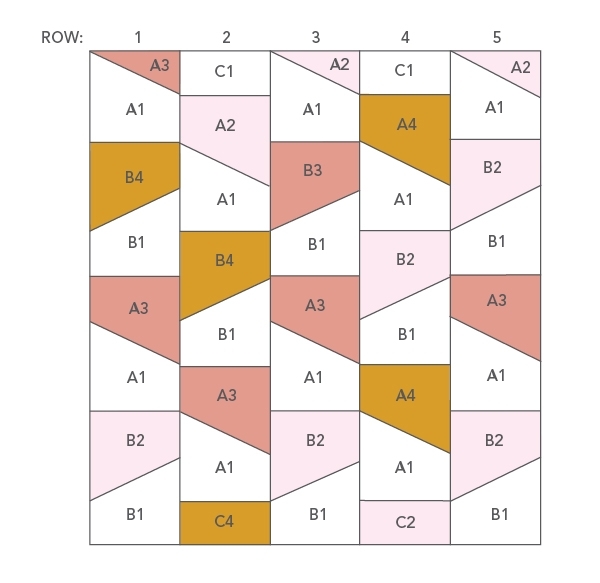 So, for Row 1 your stack will be B2/B1, A3/A1, B4/B1, A3/A1. Start by pinning the first two pieces in each stack, right sides together. So, for the Row 1 stack that will mean pinning the bottom of the A3/A1 Block to the top of the B4/B1 Block, and for Row 2 it will mean pinning the bottom of Piece C to the top of the A2/A1 Block. Arrange the pinned pieces in row order, 1 to 5. First, sew the two Row 1 pieces together along their pinned edge. Do not pick up the foot or cut the thread at the end of the seam, instead, feed the Row 2 pinned pieces into the machine directly afterwards. 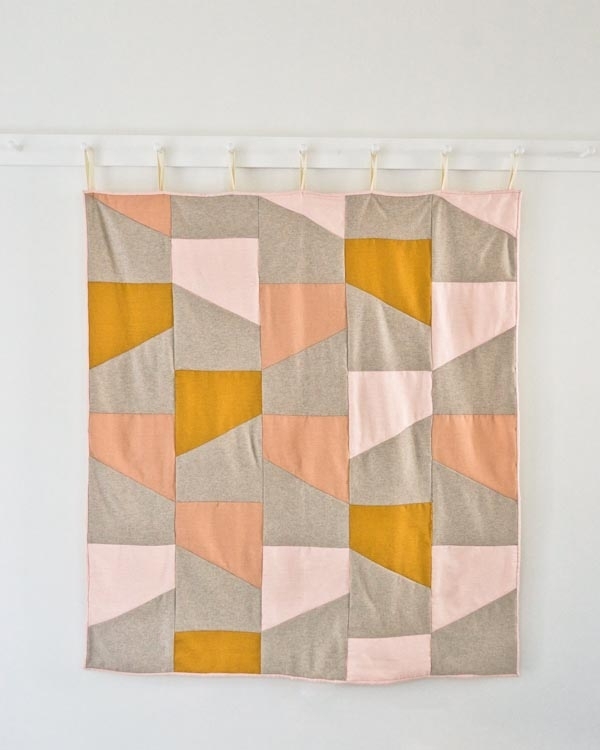 Repeat until you have sewn together the pinned pieces of all 5 rows. Snip the five sections apart and then pin on the next block or C piece from each stack. 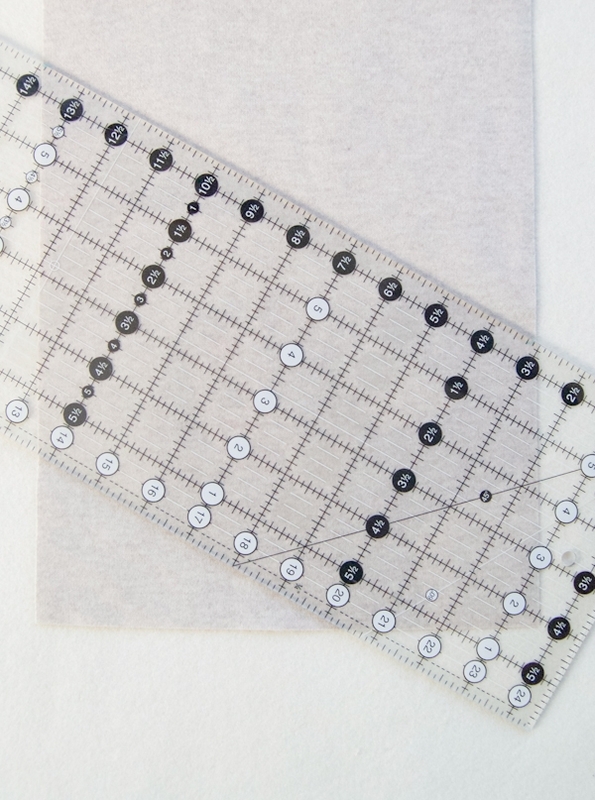 For example, for Row 1 you will pin the top edge of an A3/A1 block to the bottom edge of the B4/B1 section you just sewed. Repeat for all 5 rows and then chain piece them together. 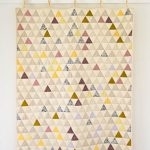 Keep pinning and chain piecing in this manner until all 5 rows are complete. Press all of these seams open before proceeding. Sew the Rows Together Starting at the bottom edge, pin the left side of Row 2 to the right side of Row 1, right sides together. Make sure that the seams meet up neatly where they should. For instance, if you look at the lower left of the diagram, you will see that A1, B2, A1, and A3 should meet at one point along this seam. When you get to the top of the seam you will see that Row 1 is longer than 2. Use the rotary cutter to cut Row 1 to align with Row 2. 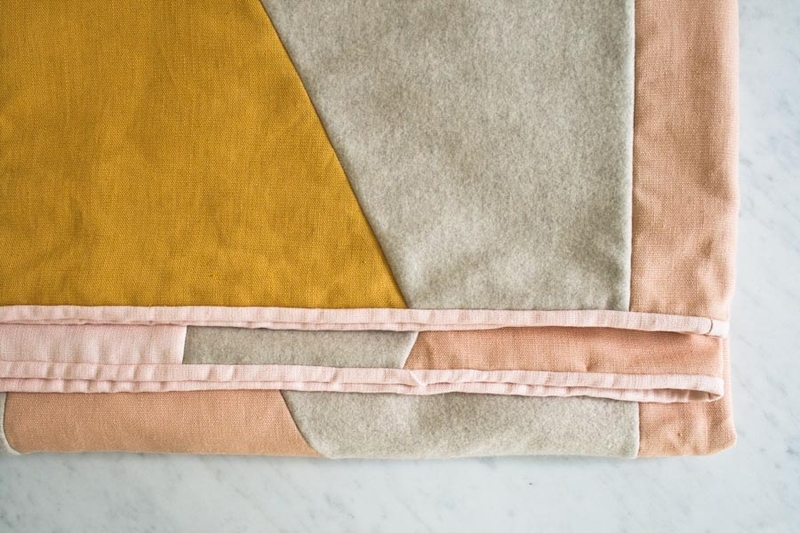 Sew these two rows together and press the seam allowance open. Repeat for all of the other rows, cutting down Rows 3 and 5 as you get to them. 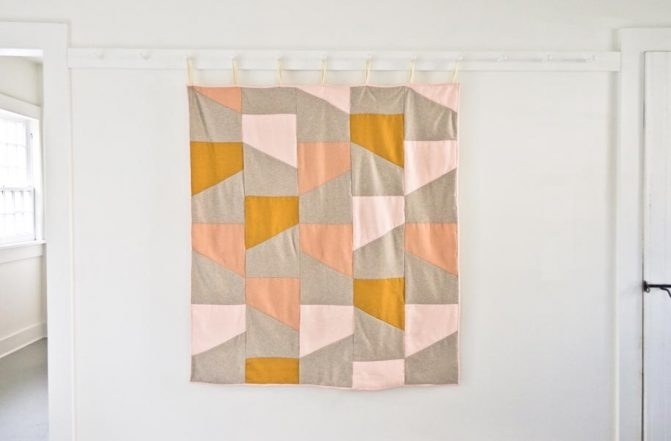 Your quilt top is finished! Start at “start 1,” illustrated above. 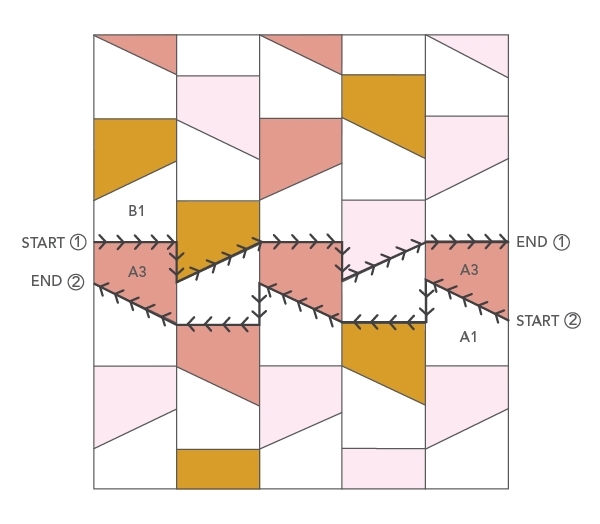 Sew along the horizontal seam on Row 1 between B1 and A3, and then zigzag horizontally across the quilt, as illustrated in the diagram above, ending a couple of inches into the batting (“end 1”). 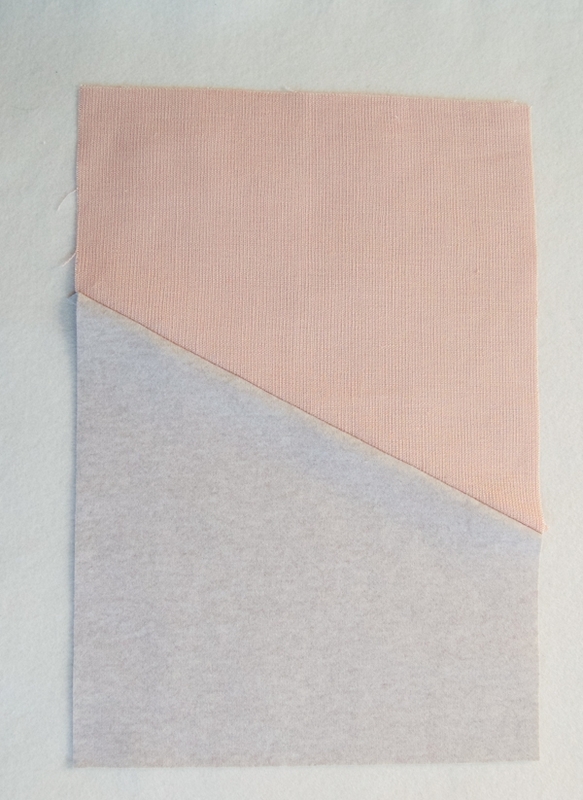 Cut the thread and then sew in the reverse direction along the next seam below (“start 2”). 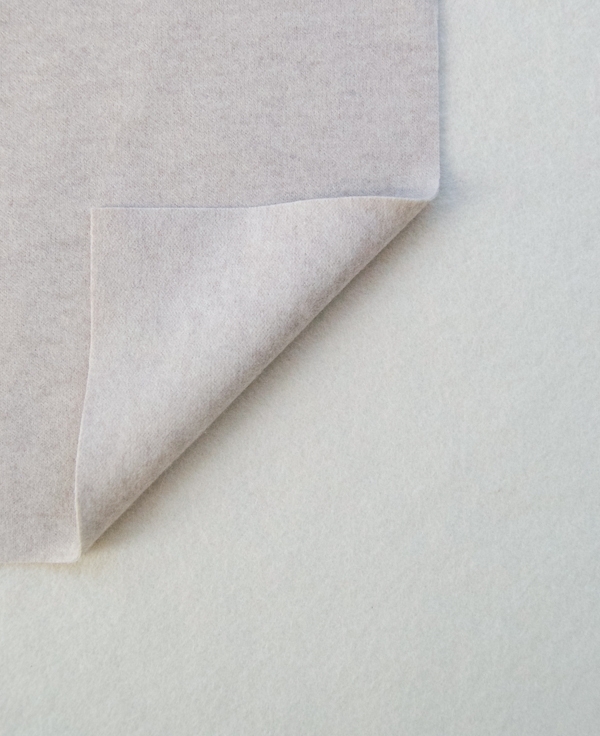 Repeat this process, reversing direction for each seam below, then do the same for all of the seams above. 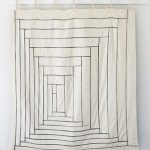 You will be left with many unquilted vertical seams. 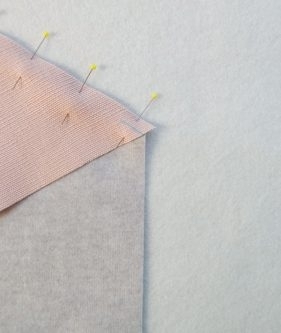 Sew along each of these vertical seams, one by one, backstitching at the beginning and end of each seam, or if the seam is on the outside, starting a couple of inches into the batting and backstitching at the end of the seam. Use the Binding Strips you cut from Fabric 2 to bind the quilt with double fold binding. For instructions on how to do this, please check out our Making Double Fold Binding and Sewing on Double Fold Binding Tutorials! 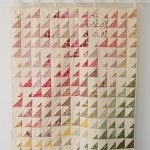 i am so excited to start on this quilt. But I am wondering about washing the fabric….. normally I would before I begin. would you prewash all the fabric? thank you. 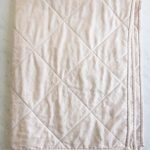 This quilt is hand washable only because of the different fiber contents of the fabrics so you don’t need to pre-wash.